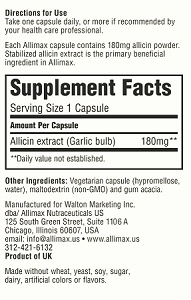 Allimax Capsules - 100% Allicin - 180 ct. So let me tell you my story… Starting in 2006 from every October to every April I am sick, generally about every two weeks with something different. I usually end up in the hospital or the ER at least 3 times. I have been tested for lupus and other various autoimmune disorders. This December I'm getting married and unlike most brides I have nightmares of waking up on their wedding day and having to be rushed to the ER. I am normally on steroids and antibiotics non stop. I came across this product and desperately tried it. Now, I can not admit that is was my mericale worker as it has only been a month. But, it is November and so far I have only been on one round of steroids and antibiotics and to be far I was on those before my Alimax arrived. I did manage to get over a sinus infection and bronchitis in a week with the help of Alimax on top of steroids and antibiotics. I also am on the autoimmune diet - even though all my test came back negative. So, it's hard to say what is keeping me healthy but I will tell you I plan on staying on Alimax until April. I will update again when my trial is more conclusive but I am happy and healthy and it could very well be thanks to this product! This product brought down my 94 year old father's blood pressure and had no side effects. Unfortunately, the medicine did. We weaned him off the bp pills and his blood pressure went up. Allimax brought it right down. I will continue taking this product forever. This product marked the end to my major Lyme symptoms and all I need now is to keep up my good eating, supplement taking, and sleeping habits. Now I can move forward in life with everyone else in this world of fascination. My only complaint is the swollen lymph node under my chin. It hurts like a bee, but after about 2 weeks the pain went away. I would rather have that pain over the death of my entire being. This stuff is the real deal and if your LLMD recommends it to you, or you're doing it on your own, you definitely need this in your regime. Thank you Nutricudicals US for such a high quality product. I've taken these for years and they fight off everything. Quick response on the order and delivery. 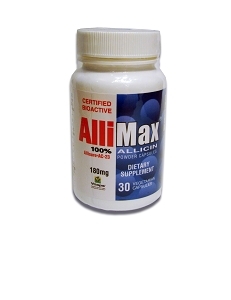 Q: The Allimax allinen capsules are they enteric coated?